In this file photo, MSNBC Democratic Candidates Sen. Bernie Sanders and Fmr. Secretary of State Hillary Clinton appear during the "MSNBC Democratic Candidates Debate" on Thursday, February 4, 2016 at the University of New Hampshire at Durham in Durham, NH. NBC News, MSNBC and Telemundo will host the first 2020 presidential primary debate in June, the Democratic National Committee announced Thursday. The debate could be held over two consecutive nights in prime time, given the anticipated size of the field, the DNC said. 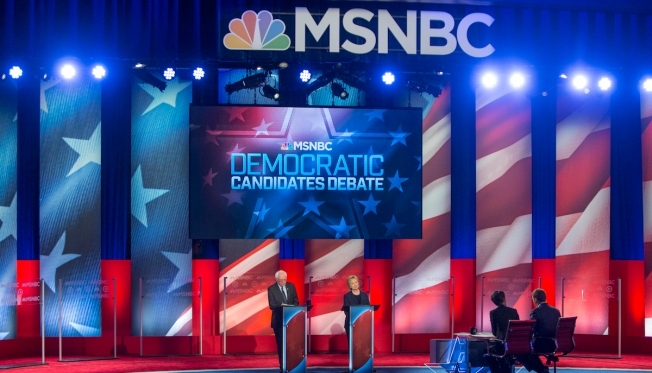 NBC News, MSNBC and Telemundo will broadcast the debate simultaneously on back-to-back weeknights in June, should multiple debate stages be necessary. The debate will also stream online free on NBC News' digital platforms, including NBCNews.com, MSNBC.com, the NBC News Mobile App and OTT apps in addition to Telemundo’s digital platforms. The debate location and exact dates are yet to be announced.